Weekly playgroups allow moms and kids to socialize in a home or park setting. Kids have their time to play and make new friends. Our monthly MNO is highly anticipated by our members! Example activities include: dinner, spa, gallery night, shopping, dancing, movies, etc! During the summer months, we schedule park days. We meet at various local parks to give the kids a chance to play with each other, reconnect with each other after the long winter, and enjoy the great weather and sunshine. See our great list of local parks! Need motivation to get reading again? Join the book club to discuss interesting book selections while the kids play. It really is possible! This club typically meets on a monthly basis. Any member is welcome to join in any activity or event and children are always welcome! However, most moms choose not to bring their children to our monthly MOMS Night Out (nursing babies are always welcome). Our activities are usually free of charge or for a minimal cost. You can choose to participate in as many activities as you like. 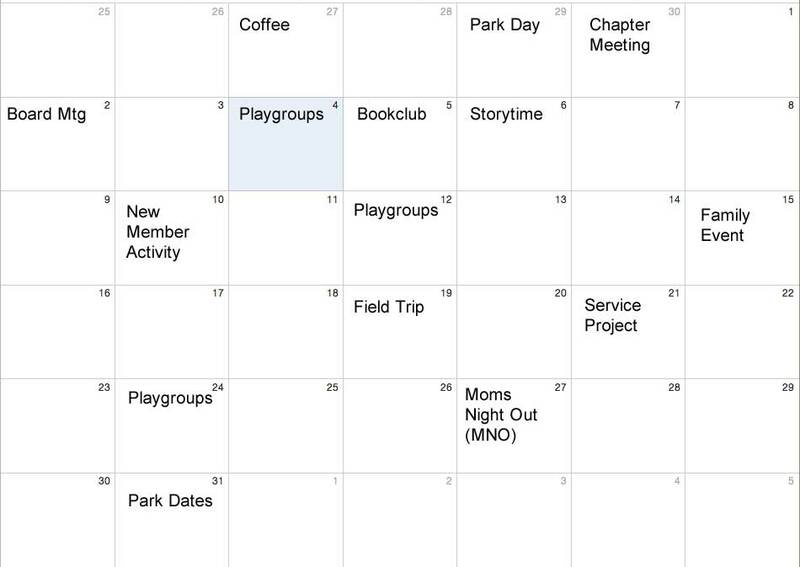 NOTE: This is an example calendar to illustrate our activities. In order to protect our members privacy and for the safety of our children, we are not able to show our actual calendar to non-members. Thank you for your understanding. Once a month we hold a chapter-wide business meeting to discuss and vote on upcoming events. We often have an educational speaker on topics of interest to our members. We offer optional childcare during the meeting as well as an opportunity to swap supplies with other members. This is a great time to talk with other moms and get involved in determining the future direction of the chapter. An activity or event held once per month to include husbands (and kids). Field trips are a great chance to get out and explore the community with other moms/kids, whether it be a trip to the zoo, children's museum, local farm or play.